Hi, I just ran across your sourdough page and have a few comments. First, and probably foremost, I've always understood that sourdough starter should never contain anything but flour and water (or milk, in the case of San Francisco sourdough) -- no sugar, no honey, and definitely no yeast. Second, you may be working too hard, letting it sit for several hours before using and before returning a portion to the refrigerator. I've had my current starter since the early '80's and made that only because I goofed and forgot to save my previous starter, which was from Kodiak in the late '60's. I used the potato water recipe to make new starter. I keep the starter in the fridge, take it out and mix it ALL with more water and flour, and let it sit, covered, overnight on the kitchen counter (not necessarily in a warm place, but not on the back porch). The next day it has risen and is ready for use. Before adding any recipe ingredients I return an adequate amount of the starter to its clean container and put it in the fridge right away. It stays for up to four months on occasion, but usually is used every couple of weeks or sooner. Mixing all the starter with flour and water, then returning a portion to the fridge, keeps (I think) the starter fresh. 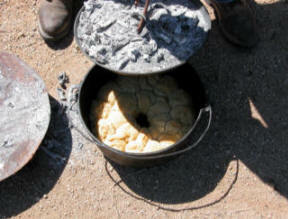 Some use just a portion of the starter, then add flour and water to make up what they took. In my experience, this tends to make a more sour starter which requires occasional "freshening" -- tossing all but a small portion and mixing it with flour and water. This is not necessary using my method of mixing all the starter -- but you have to be sure to save some before you add recipe ingredients. On the other hand, whatever works for you is best. Good luck and best wishes. In a small bowl, dissolve yeast in warm water. In a larger bowl, stir together 2 cups flour, the sugar and salt. Add yeast mixture, 6 tablespoons of melted butter, egg, starter, and milk. Beat with a heavy-duty mixer or wooden spoon for about 5 minutes or until well blended and smooth. Gradually beat in remaining 2 cups flour. Cover and let rise in a warm place until doubled – about 45 minutes. While dough is rising, mix together 1 cup packed brown sugar, 1 cup raisins, 1 teaspoon cinnamon; 1 cup ground nuts optional. Pour 4 tablespoon of melted butter into a 9 x 13 baking pan, tilting pan to coat bottom. Stir dough down then stir in the cinnamon mixture. Drop into pan by large spoonfuls, making about 15 rolls. Cover and let rise in warm place until light and puffy – about 30 minutes. Drizzle remaining melted butter over rolls. Bake in preheated 400˚ for glass dish (425˚if metal) oven 15 – 20 minutes or until brown. Turn out onto a plate. If desired, glaze or frost with butter cream frosting, and serve hot pulling rolls apart. This also makes tasty onion biscuit by reducing sugar to 1/4 cup and stirring in 1/2 finely chopped onions prior to dropping into pan. Here follows several very fine recipes for sourdough pancakes or flapjacks, take your pick 'cause they're all real good. 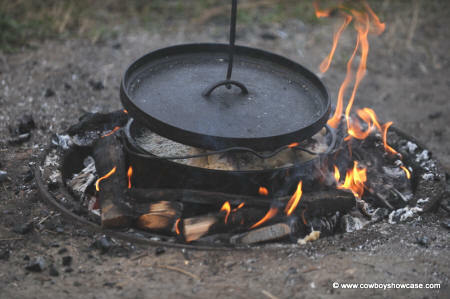 These cakes are especially delicious when cooked out-of-doors over an open campfire when you're fishing, hunting, out gold prospecting or mining. I'd honestly like to give the right folks credit for their recipes but for the life of me I simply don't recall who gave what...it's been a few years. The sourdough starter is the basic ingredient for everything you will make that's called sourdough whatever. Sourdough is simply home-grown yeast! Given the hosts of flour and warm water, the yeast spores break down the starch into sugar, permitting fermentation to take place. In bread baking, the sourdough acts primarily as the leavening or raising agent. The sourdough base is often called a sponge and from it springs bread, biscuits and flapjacks. The sponge has also been used to heal burns and wounds and even make a kind of hooch. Sourdough fed generations of miners, trappers, mountain men and pioneers--and, later on, farm and city families. The real sourdough starter, like the old timers used, did not use yeast! The less yeast used the richer and headier the sourdough becomes but the trickier the recipes are. Here's a recipe for sourdough starter made from scratch without using yeast: Mix two cups of all purpose flour with enough lukewarm water to form a thick batter. Let this stand uncovered for four to five days, or until it begins working. This basic recipe requires storage in a well scalded container. An alternate is to use warm milk in place of the lukewarm water. Somewhere along the trail I picked up the following method for making the sourdough starter: mix one cup of flour with one cup of room temperature water. Cover the mixture and let stand in a warm place overnight. Next morning add one cup of flour and about a cup of room temperature water. Mix well, cover and let stand in a warm place for up to twenty-four hours. Repeat the adding of flour and water at least one more time then let the mixture stand and work in a warm place for a day or so until you see a lot of foam and bubbles on top of the starter. The starter is now ready to use. In times gone by, a lot of people made their starter by mixing enough flour with water in which potatoes had been boiled to make a thick batter... let stand a day or two or else until it smelled right. Mix four cups of flour, two tablespoons sugar, four cups lukewarm potato water in a crock or jar and let stand uncovered in a warm place for several days. And finally, let one cup of milk stand uncovered a day or so at room temperature then add a cup of flour, mix well and let the mess stand a couple of days at which time it's ready to use. If starter is normally kept in the refrigerator take it out several hours in advance of use or until it is at room temperature. After each use be sure to replenish the starter by adding enough flour and water to restore the mixture to its original consistency and let the sponge work in the container at least a day before storage back in the refrigerator. Note: a teaspoon of sugar may be added to the starter during the replenishment. Here’s another starter recipe called "Herman" as passed on to me by Mrs. Kim Kendall of the Peeples Valley community in Arizona. Dissolve I pkg. of dry yeast in ½ cup of warm water. When the yeast and water begin to foam mix in 2 teaspoons of sugar or honey, 2-1/2 cups flour and the remaining water [2 cups]. Store in a sterilized large glass jar (crock or plastic jar are OK too). Cover with clear plastic wrap. No Metal is ever permitted to come in contact with the starter. Keep at room temperature for 24 - 48 hours. The mixture will bubble up and should be stirred down and then placed in the refrigerator. Stir daily with wooden or plastic spoon. On 5th day feed Herman: 1 cup flour, 1 cup of milk and ½ cup sugar and stir well. On 10th day take out 2 cups of the starter for baking , then feed same ingredients as on 5th day to keep starter going/working. DON'S LONG-TIME FAVORITE: SOURDOUGH, SOUR CREAM, BLUEBERRY PANCAKES. This fine recipe came from Mrs. Edith Smith when I lived in Pampa, Texas sometime during the mid 1970's. Night before: remove starter from the refrigerator and either get it to room temperature or use warm water. Empty all of the starter into a large clean bowl and add: 1 - cup water, 1 1/2 - cup flour and 1 - teaspoon sugar. Mix well, cover with several folds of damp paper towel or a dish towel, to keep crust from forming, and leave overnight at room temperature. Next morning: take out 1 - cup of the replenished starter and put back in a well scalded container for refrigeration for use next time. To the rest of the starter add: 3 - tablespoons sugar, 1/2 - teaspoon salt, 1/4 - cup Wesson oil ( or such), 2 - eggs well beaten. Mix thoroughly with beater then add 1/1/2 - teaspoon baking soda. Beat thoroughly with the beater to make sure all the soda is well blended. Let sit while you fry bacon or sausage then fry the cakes/flapjacks. Alternate: after saving 1 - cup of the starter, add 1 - egg, 2 - tablespoons Wesson Oil, 1/4 - cup dry milk (or Pet) and beat thoroughly. Then combine 1 - teaspoon salt, 1 - teaspoon soda, 2 - tablespoons sugar with a little water and blend together until smooth with no soda lumps. Add this to the above combined ingredients and mix well before frying on hot, lightly greased griddle. THIS IS THE ONE I LIKE BEST! Note: If the batter is too thick it may be thinned with milk. Serving Instructions: As each cake comes off of the griddle, add a spoon size glob of sour cream rather than butter... on top of the very top cake in the stack spoon on blueberries and juice then sprinkle on some powdered sugar. Will serve 2 - 4 hungry folks. Enjoy em while their hot, Mmmm. good! This recipe for flapjacks makes a cake that by my way of thinkin' seems to stay with a person longer than the Regular Sourdough Pancake below. Ya gotta decide for yourself which recipe is best for your galley. Into a medium size clean mixing bowl pour one cup of room temperature sourdough starter. Add two tablespoons of cooking oil and stir well. Beat one egg and stir in to the starter along with two tablespoons of sugar. Stir in three-fourths cup of flour then. Next mix one teaspoon of soda with one-quarter teaspoon salt in a small amount of water or milk and quickly stir into the batter. The sourdough batter will now begin to foam and rise in the bowl. Let the batter stand while bacon or sausage is cooked. Now fry the pancakes in a skillet or on a griddle. Note: The amount of flour added to the batter will determine its thickness, for thinner cakes add less flour. Note: Bisquick may be substituted for the flour. Butter each cake as it comes off the grill. Serve em while they're hot with whatever syrup ya like. Hope you enjoy these flapjacks 'cause they're sure 'nough good eating; and, don't forget to add flour and water to the remainder of the starter for replenishment.